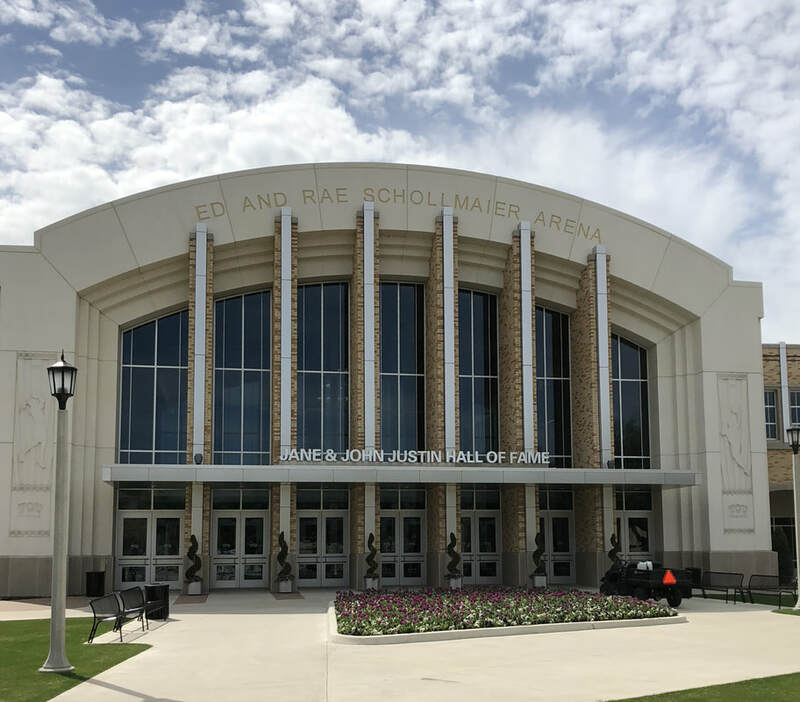 The Jane and John Justin Hall of Fame is located inside the Ed & Rae Schollmaier Arena on Texas Christian University’s campus in Fort Worth, Texas. Located on the west side of campus, and on Stadium Drive along with the Schollmaier Arena, is the football stadium and the Bill and Sue Parrish Athletic Statues, featuring some notable TCU football players and coaches. This Hall contains cases to honor the historic victories of TCU Athletics, as well as individual achievements such as All-American and Academic All-American nominations and honorees are highlighted. Along with plaques and photographs on the walls, there are also screens that can display the history of athletics through videos and sound. The first thing visible upon entrance into the Hall of Fame is the uniform rotunda, which displays uniforms of all TCU’s athletic teams. Behind the rotunda, there is a large wall of screens that have the ability to show highlights or anything TCU Athletics designs. On the back side of this wall, there are interactive screens which allow anyone to select a trophy and read about the championship story. For example, the NCAA 2012 Rifle championship trophy is visible and someone can read about the team’s success that year. Near that wall, is a display that displays notable trophies, such as the 2017 NIT Championship and 2017 Big XII Baseball Tournament trophy. Behind this display there are plaques of the names of All-Americans and Academic All-Americans. Walking towards the left, there are plaques that share important moments about TCU’s success in the Big XII conference. From entering the Big XII in 2012, to the Big XII and National Success of the Equestrian, Rifle, and Men’s Tennis teams, with Big XII championships and an individual track national championship in between. In front of those plaques is a display discussing National Championships and displays the trophies of these teams. Walking towards the back wall, there are plaques about professional athletes, and a display showcasing old uniforms and trophies from mony sports from Football to cross country. The back wall contains hand-made drawings of many special athletic individuals. These photos, seen in the "Individual Recognition" section, were completed by V. Wells and contain a facial portrait and a portrait of the individual playing their sport. On the far right wall, there are old trophies from the Mountain West Conference, which TCU used to be a part of. The Daniel-Meyer Coliseum opened in 1961, and was later named Ed & Rae Schollmaier Arena following the renovation completion in 2015. The renovation project began in 2013 to update the inside of the 52 year old arena, and also the outside so it would visually match Amon G. Carter Stadium and the surrounding athletic buildings. Jane and John Justin were longtime members of the Fort Worth community that donated to Cook Children’s hospital and the Neuroscience Department was named after them in honor of their work for the hospital. The Athletic Hall of Fame was named after them as John was a longtime TCU trustee. The John Justin Athletic Center constructed in 2000, located at the south endzone of Amon G Carter Stadium, houses football offices and a learning center, was also named after John Justin Sr (Reference 2). A very prominent figure of the Jane and John Justin Athletic Hall of Fame, is the circle of uniforms that can be seen immediately when entering through the main doors into the arena. This collection of uniforms displays the specialized uniforms Nike creates for TCU Athletics. All sports uniforms that the university has, can be seen, including the showgirls, the dance team, rifle, both men’s and women’s basketball, and many others. There are eighteen uniforms, representing eighteen sports, present on the rotunda. TCU has an athletic contract with Nike, so all of their uniforms will be supplied by them. Each uniform has a screen directly above it in order to have the ability change the display from a stationary TCU logo, to highlights from that particular sport, and everything in between for whatever event is occurring inside the arena. Rennovation Cost: $80 Million by HKS Inc. 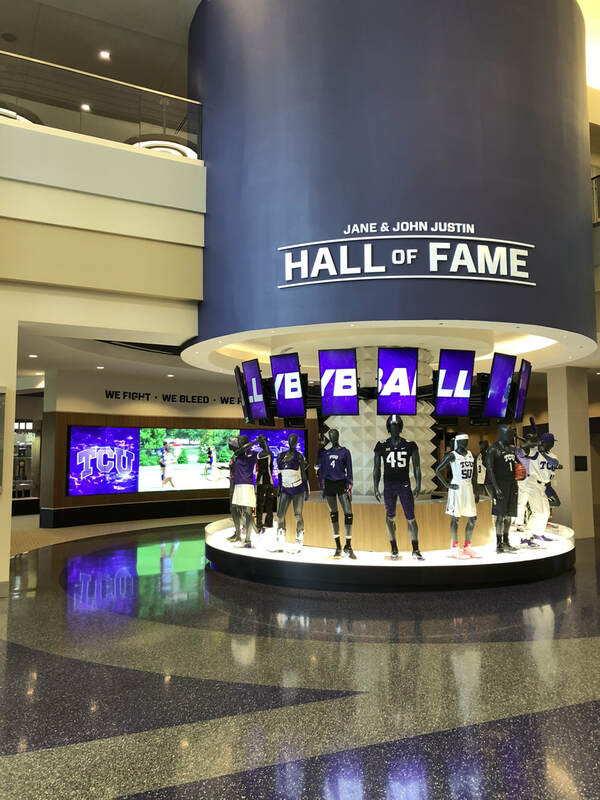 According to the TCU Letterman's Society, in order for a TCU athlete to be selected to the Hall of Fame, there is a certain criteria and process that must be met and followed in order to be nominated to the hall of fame. Once nominated, there is a process that follows to be selected. - Jason Verrett class of 2013 who competed in football for TCU and later on played professionally for the san Diego Chargers from 2014-present. - Kim Collins who represented St. Kitts and Nevis in the 100-meter dash for track and field where he competed in 5 Olympic including the 1996, 2000, 2004, 2008, and 2016 Summer Olympics. ​The Hall of Fame physically holds many of TCU’s athletic accomplishments, old and new. One of the oldest trophies includes the 1935 and 1938 College Football National Championship trophies. A National Championship is the “highest level of college football in the United States, currently the NCAA Division I Football Bowl Subdivision, is a designation awarded annually by various organizations to their selection of the best college football team” according to the College National Championship Wikipedia page. TCU displays these two crystal trophies encased in glass to the left of the rotunda of uniforms, a prominent spot so all visitors are able to see them. The Cotton Bowl is a historic college football bowl game that has been around since 1937 and still exists today. It is played in December every year at AT&T Stadium in Arlington, Texas. TCU got the opportunity to play in this bowl game in 1957, beating Syracuse 28-27. The historic trophy sits alongside many others in the Hall of Fame near the wall of Hall of Fame inductees. The NIT (National Invitation Tournament) is “is a men's college basketball tournament operated by the National Collegiate Athletic Association (NCAA). Played at Madison Square Garden in New York City each March and April, it was founded in 1938 and was originally the most prestigious post-season showcase for college basketball” according to the National Invitation Tournament Wikipedia page. This 2017 post season tournament championship win for the Frogs signified a comeback with the new head coach, Jamie Dixon. The trophy sits in its own case behind the large display board. Next to the trophy is a large board writing about this historic win for TCU. It writes, “It was a breakthrough season for TCU, which also defeated a No.1- ranked team (Kansas) for the first time, swept Texas for the first time in 30 years and averaged the second- most patrons (6,127) per home game in school history.” TCU clearly marks their wins and athletic accomplishments displaying them prominently in the Hall of Fame. TCU also displays individual awards including the Doak Walker award that was presented to LaDainian Tomlinson (see above) in 2000 for the National Running Back award in Football. It was first awarded in 1990 and honors “the top running back in college football in the US” according to the Doak Walker Award Wikipedia page. The Cy Young Award is presented to the best pitchers in baseball annually. According to the Cy Young Award Wikipedia page, the award was first introduced in 1956 by Baseball Commissioner Ford Frick in honor of Hall of Fame pitcher, Cy Young. It was presented to TCU’s own Jake Arrieta, who currently plays for the Philadelphia Phillies, but pitched for the Chicago Cubs at the time. The Cy Young award is placed in a trophy case along with many other baseball artifacts. The Heisman Trophy, one of the most prestigious awards given in college football, sits in the TCU Hall of Fame. The award is given to someone who presents “outstanding performance which best exhibits the pursuit of excellence with integrity. Winners epitomize great ability combined with diligence, perseverance, and hard work” according to the Heisman official website. TCU’s winner, Davey O’Brien, was the first quarterback to win the award. The display case for this award is prominently displayed in across from the National Championship Trophies. 1. “John Justin Athletic Center.” GOFROGS.COM - TCU Horned Frogs Official Athletic Site - Facilities, TCU Athletics, www.gofrogs.com/facilities/tcu-facilities-justin.html. ​3. “Past Hall of Fame Inductees .” Letterman's Association, 2018, lettermens.tcu.edu/past-hall-of-fame-inductees-by-induction-year/. 4. Photos taken by Caroline Runge and Howard Lee. March 8, 2018. 5. “Heisman Trophy Winners.” RSS, heisman.com/roster.aspx?path=football#.